In the last two decades, there have been significant developments in membrane filtration processes for the dairy and beverage industries. The filtration systems can be classified into four main groups: reverse osmosis, nanofiltration, ultrafiltration and microfiltration. The primary objective of this book is to assess critically the pool of scientific knowledge available to the dairy and beverages industry, as a tool for process and product innovation, quality improvement and safety. The book is divided into three main parts. Part I reviews the principals, developments and designs of membrane processes that are mainly used in commercial dairy and beverage applications. Part II provides information on the applications of membrane processes in the manufacture of dairy products, from on-farm concentration of milk as a pre-treatment for cheesemaking to fractionation of milk and whey to provide ingredients for food and other applications. Part III considers membrane applications during the manufacture of fruit juices, beer and cider, wine and vinegar. These include concentration, deacidification and dealcoholisation processes. 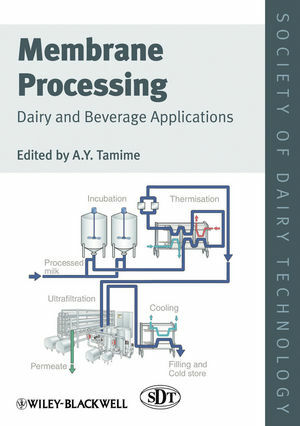 Membrane Processing: Dairy and Beverages Applications is an ideal new reference for dairy and beverage processors involved in the application of membranes, both to aid the creation of novel products, and to improve their process economics. Students and lecturers of food and dairy science and technology will value its in-depth discussion of membrane processes, whilst readers based in the dairy industry will prize it as the most up-to-date and advanced volume yet published on this crucially important topic. A.Y. Tamime is a Consultant in Dairy Science and Technology, Ayr, UK. He is the Series Editor of the SDT’s Technical Book Series.